Kahuku... I make it by there every once in a while. It’s a refreshing break when work takes me there. Usually it’s a long twisting drive no matter which direction you come. Bummer if you’re stuck behind a bus! This time I got there a little differently. For a week the cloud base had been holding high over the Koolaus. Unfortunately, the wind was just a little too strong to take advantage of the situation. On Monday, January 6th of ‘06, that all changed. In the afternoon, the wind finally came down a notch. I threw my stuff in the car and I blazed over to Makapu’u. As I walked up to Crazyman’s, I ran across Fireman Dave. He was standing there, surrounded by a family of tourists, getting worked hard for a ride and a “Di$count”. As I walked by, he backed away and asked “down range?” I gave him a nod and said “Oh yeah”. That’s all it took, we were on the same page. Daylight was going fast, and there was no time to stand around and pontificate about some sort of plan. While he went back to excuse himself from the bargaining tourists, I continued on my way to launch. Jetflap Jeff was there and getting ready to layout. He told me that he was going to grab a “short flight”. I checked the wind and thought it a bit light and decided to head up to Tomato Juice. On my way up to Juice, Jeff was up and flying. As I got to the top of launch, Dave was just pulling away with a clean escape from Manic Depressions. After he benched up, I could hear him on the radio already going to work on Jeff. “What are your plans? Want to go down range?” After a bit of prodding, Jeff gave in. The wind was just a little light at Juice. My first attempt at launching was thwarted by a shorter than expected cycle. By the time I got things clear and ready for a second attempt, I heard Dave and Jeff talking. They were up at the hang launch and starting their way down range. After a long wait, a nice even cycle came through. I was up and it was only 4:55 pm. The lift was smooth and very consistent. I did one quick figure eight on the Hang Ridge and headed down range. I caught up to the guys at the end of Green Wall. The air was cold and very hazy from the big surf. The best part though, was the cloud base, it was nice and high at about 4,000 ft. I spent the majority of my trip comfortably cruising down range at about 3,000 to 3,500 ft. not having to dodge a single cloud the entire way. 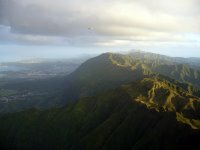 This allowed me to soak in the awesome, and very rare, simultaneous views of Town and the Windward side. 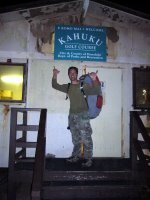 Around Likelike, Raimar got in touch with us via radio. He had flown Kahana earlier and was now hanging out at a friend’s house. He was incredibly gracious and offered to pick us up at the Hygienic store and take us back to Makapu’u. Little did he know what he was in for! Conditions were so perfect, there was no way Dave and I could call it quits. Even if the sun was getting a little low. As we pressed on, Jeff continued his “short flight”, quietly flying Tail End Charlie. After reviewing some of the pictures I took, I could see why Jeff might have been so quiet. He was as close to OTB as one could get, without actually doing it! Take a look, you’ll see. Coming through Waikane, Dave and I talked about which way we were going to go. We decided that in the interest of time, it would be best to go the back way. 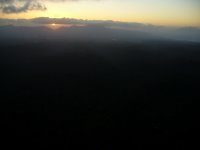 Approaching the point of no return, I still had good altitude over the ridge. So I charged on in to Buga Buga Land. With only a small bounce here and some minor sink there I was able to maintain a comfortable altitude. I radioed back to Dave and asked if he was coming. 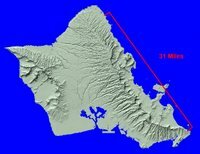 He mentioned to me that he just tried to turn back towards Makapu’u to check the head wind, and was only able to make 4 mph. He concluded by saying, “I guess I’m coming”. Jeff followed suit. 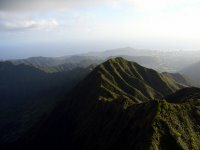 Conditions allowed me an amazingly clean and uneventful transition through the back of Kualoa and Kahana. As I pulled into Green Valley I gave Alex a call (this was before his cell phone fell in the toilet). I told him, “Turn on your radio and look out the window, cause we’re coming over.” When he came on the radio you could hear the surprise in his voice. It was nice that he was home. He quickly began to pass on some notes from previous XC flights, some of which ended up in less than desirable LZs. I was quizzing him as to the exact location of his house, when he smartly showed me where he lived. “Can you see me?” he was flashing the high beams on his car. That’s when Dave brought up a good point. He reminded us that in the waning light, power lines tend to disappear. Continuing on, past Alex’s 'hood, he told me that he was packing the kids in the car and going to give chase. At about that time, I lost sight of Dave and Jeff. They were still working their way through Green Valley. Then my radio decided it had enough and went to sleep, figures. Passing Sacred Falls, I watched the ridgeline fall away as I entered into La'ie. Now on glide, I started to scan the distance for possible LZs. BYU was just up ahead. There were a plethora of places to land around there. My altitude was bleeding off slower than anticipated and I easily breezed past the beautifully lit campus. Looking ahead, I saw that there were a couple open fields along the highway. When I reached them, I still had more than enough altitude. So I crossed the highway and headed towards a bay. Upon arrival, I noticed that the beach was missing. It had been swallowed up by the high tide. Where to now? Fortunately, I spotted one more possibility. It appeared to be a long pasture nestled against the shoreline. It was borderline make-able. I went for it. As I flew closer, the place began to look a little cleaner than a pasture. What the?... wow, a golf course! Cool, that will make a great LZ… but the only golf course I know up here is… finally it dawned on me. You got to be joking! Kahuku Golf Course? I had to laugh. 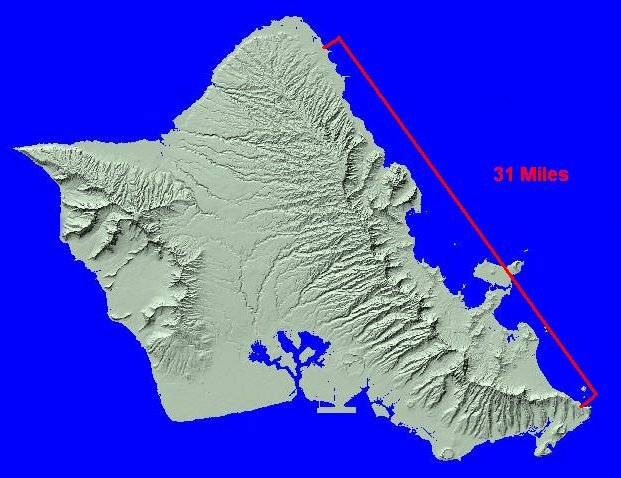 Not only did I never expect to launch from Makapu’u one day and land at Kahuku, especially that late in the afternoon. But I had just been there the week before with Alex. We were going to fly the North Shore but it was raining. While we waited for it to pass, he gave Don, Leo and me a tour of the dunes. Little did I know, I was actually scouting out a future LZ for myself that day. When I came in over the course, I flew past the high dune and picked a spot on one of the fairways. I ended up touching down in the middle of the 7th fairway, the one nearest the beach in front of the clubhouse. I called Alex on the phone, he and the kids were on their way to pick me up. Over time and in passing, I have heard the locations of previous XC land outs, but since I’m not that familiar with the area. I had no idea where they were. So needless to say, I was quite surprised by the news when Alex informed me that this was the farthest anyone had landed out. To mark the occasion, he took my picture at the pro shop. He also told me that Dave and Jeff landed back at Gunstock Ranch, which equalled Troy’s previous record. They were waiting there with Raimar to give me a ride back. Just for kicks, he zeroed out the trip odometer in his car for the ride back to meet them. When we got there, it read 1.0 mile. I would like to thank Alex and Raimar for all the groundwork and of course, my partner in crime, Fireman Dave. Truly an amazing flight! What a great story, Mark. I corrected a few minor spelling issues and moved the pictures as you requested. And you can always edit the post some more yourself if you want. It was fun chasing you with the kids - they really got into it. Even if it meant they didn't get dinner 'til like 9 pm. Doh! 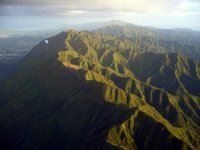 What I love about your flight is that Kahuku is just as far from Makapuu as Haleiwa is, so you don't gain anything by turning the corner there - the only way to go farther now is to jump OTB at Punaluu and cross the flatlands of Wahiawa towards Kaena Point. But you guys will have to call and invite me for that one! Your pictures came out great too. The lighting at that time of day is very dramatic. I was curious about where you shot the Waianae Sunset picture, so I opened it in Photoshop and lightened it up all the way - it's too grainy to keep it that way, but it allows you to see the Sacred Falls plateau in the foreground very clearly. Cool! Man . . is there ANY record that you do not hold? Hey Mark thanks for writing up Mondays impromptu adventure, you got the record and the photos. I was feeling great right after I blew off the pushy tandem passegers, so the sight of you in flight mode motivated me more to get up and go. I was just thinking about a late afternoon downranger to Hygenic Store since I had been chomping at the bit after missing so high cloudbase days with potential. I caught one thermal that day on the peak between Pali and Wilson tunnels. You could have flown straight the whole way and have gone just as far. There was one especially memorable moment when I had gotten a little low just as I was about to cross the little spine in the back of Boogas, the crux of the trip, and I was getting tossed around a bit on the Funky. I turned back to gather a little more altitude before going back at it again. 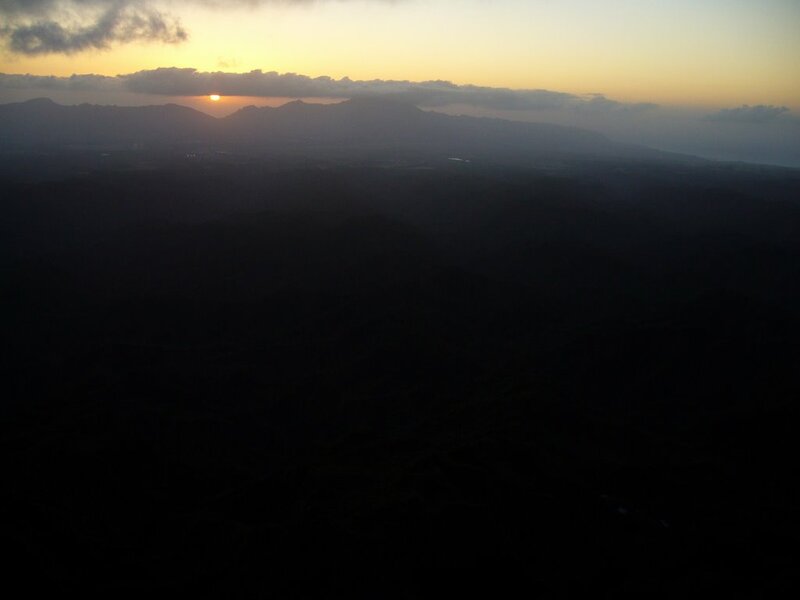 As I turned back I see Jeff is down near my altitude and the light from the already set sun is behind the Waianaes. I figure I wasn't interested on being in Boogas in real dark, since we could already see the streetlights. I then turned back around, gave the glider a little speed and charged through the tough spot that I had encountered moments before. I was then rewarded with relatively smooth flying all the way out of Green Valley. I made a few jokes over the radio about flying ten feet further then Mark, who was by then out of sight in the ever darkening sky. I had my eye on the illuminated football field at Kahuku High School which I knew would be the record. But between the open pastures at Gunstock Ranch and my glowing goal was a dark tree studded swath that had me contemplating the ever increasing reality that I might find myself bouncing off powerlines in the dark if I continued on. I saw the "beach" where Mark headed but I didn't see any sand. So an easy landing in Gunstock was good enough for me, Jeff came cruising in high out of the darkness and landed just past me. I give Jeff credit for telling Lana he was going out for a "short flight" and doing it without any instruments, though somewhere around the Greenwall he realized that it was too east to fly back to Makapuu and wisely continued on. 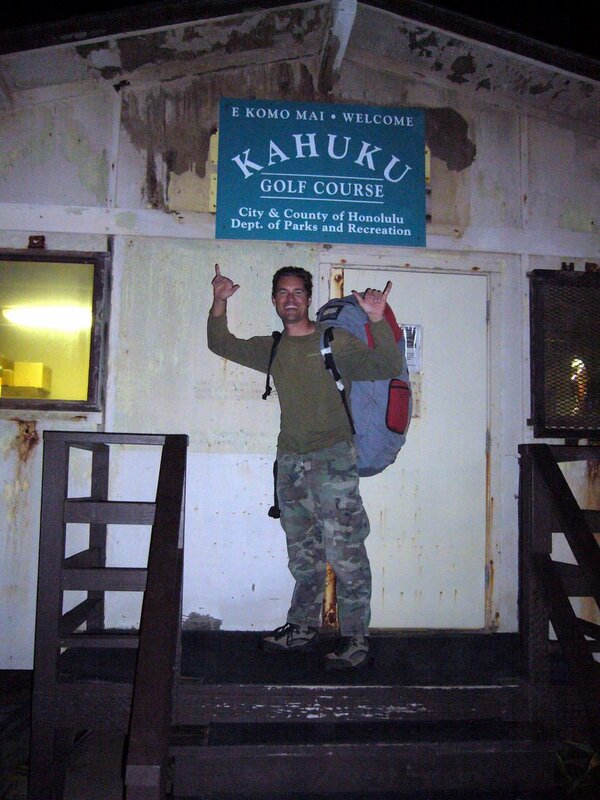 Mark on the otherhand charges hard and showed what an Ironman he was by hopping over in front of the ironwoods at Malaekahana, downwinding along the dunes to land at the 7th Hole ( a popular Kona wind surfspot)at Kahuku Golf Course for a new state record of 31+ miles, all in near total darkness. Amazing. All in all the flight lasted about 2 1/2 hours, counting hanging around at Makapuu waiting for the bush guy to launch. I got a hair over 30 miles according to my GPS, a personal distance record and I finally conquered BoogaBooga Land with my friends along to boot! Congratulations on the flight. It was great fun. Can we get a photo of Fireman and I at the Gunstock Ranch sign? Jeff, check with Dave. I took that picture with his camera. Fun flying with you.